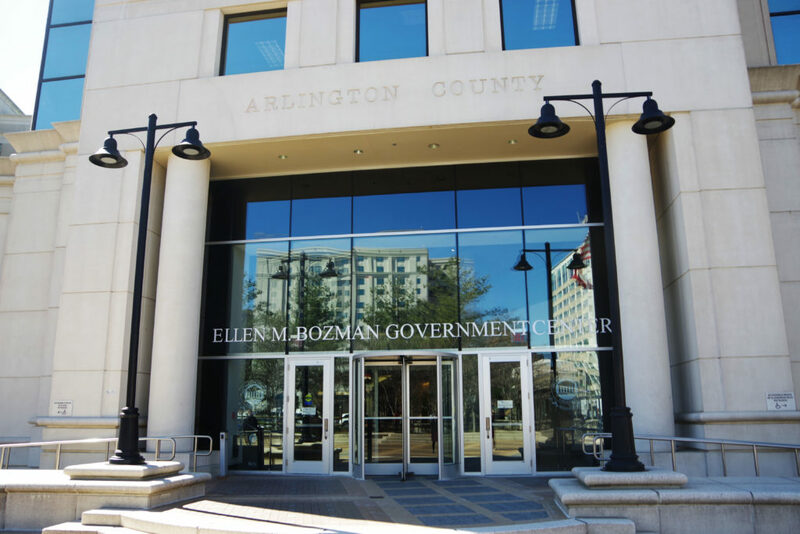 This Saturday, the County Board is set to vote on long-awaited zoning changes “to eliminate perceived and actual barriers to child care” in Arlington. The bundle of zoning ordinance amendments the Board is poised to approve aim to add more childcare centers to the county and ultimately make the service more affordable. It’s the latest component of a discussion that’s lasted years on how the county can help parents struggling to afford rising childcare costs. One of the zoning amendments up for a vote Saturday would end the requirement that small family daycare homes need to apply for extensive county approval if they cared for up to nine children. Family day care centers with nine or fewer children could thus be approved “by right,” whereas now the cap is five kids. The maximum number of children these smaller facilities could care for would also be lifted to 12 from nine, but the new “by right” exception would only apply to facilities caring for nine or fewer kids. Another amendment would reduce parking requirements in light of findings that indicated current lot requirements were too costly for new businesses and that many staff and parents travelled by public transportation. The amendment would change the requirement from one parking space per daycare employee to one space per eight children cared for by the center. The vote has been delayed several times: Board members originally aimed to pass the changes before the end of 2018. In the summer, members approved a “Childcare Action Plan” to grant parents daycare subsidies. The zoning changes have been in the works for months, and were approved by the Planning Commission’s Zoning Committee in January. If the Board passes the bills, the zoning changes will go into effect July 1. “We’ve come a far way, but we’ve got a long way to go,” said Board member Libby Garvey at the time. Childcare services in Arlington are among the country’s most expensive, costing an average of $21,000 a year per child, according to estimates from the Economic Policy Institute. In addition to voting on the childcare zoning bills, the Board is also scheduled to discuss a proposal to increase legal aid funding for the county’s undocumented residents and a controversial subsidy package for Amazon. 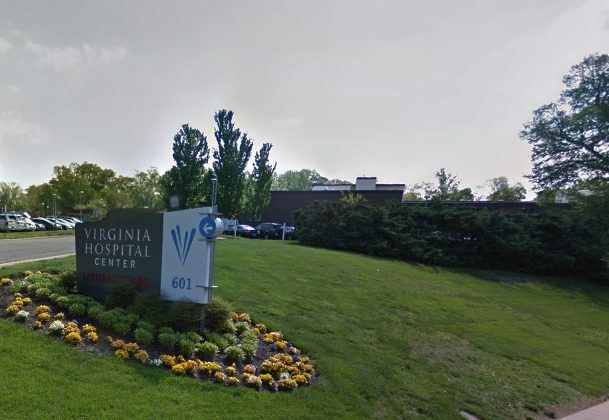 Virginia Hospital Center executives celebrated when they finally earned permission to expand the hospital’s North Arlington campus and execute a long-planned land swap with the county — but one of the consequences of the deal has some employees and parents feeling blindsided. VHC is gearing up to send Arlington its property at 601 S. Carlin Springs Road in Glencarlyn, in exchange for gaining control over a piece of land at 1800 N. Edison Street. The latter property is adjacent to its existing facilities along N. George Mason Drive, and will be a key part of the hospital’s hotly debated expansion plans. Of course, that’s going to prompt some big changes at the Carlin Springs Road site as the county takes over. Among them is the impending closure of a childcare center that the hospital operated on the property in tandem with Bright Horizons, serving VHC employees and local parents alike. The daycare facility is now set to close on July 26, according to letters from both VHC and Bright Horizons provided to ARLnow. Though that deadline may be a full four months away, parents with kids at the daycare say they’re now scrambling to find alternative options. The county is currently facing a childcare crunch, with local leaders currently weighing strategies to bring down the cost of daycare options in Arlington, and VHC parents say those conditions have only exacerbated the shock they felt about the childcare center’s closing. A spokesperson for the hospital would only confirm that the center is closing sometime this year, saying that “the details of the closing are still being worked out,” but otherwise would not comment on the situation. Mike Malone, VHC’s vice president for administrative services and chief human resources officer, wrote in a letter to parents that it was his “great disappointment” to have to close the center. He said “the county will be repurposing the land on the Carlin Springs campus and demolishing the building,” prompting the closure — VHC leaders previously told ARLnow that the land swap would be finalized by May or June at the latest. In a letter of their own, Bright Horizons executives pointed to the “over two dozen centers spread across the metro area” that the company operates as options for parents. They also noted that they have “resources available to facilitate your child’s transition,” and said they plan to help staff at the center find jobs at other Bright Horizons locations. Parents at the center told ARLnow that help is appreciated, but they fear it isn’t enough to manage the transition. Arlington school officials are planning some major changes to how parents register for the “Extended Day” program, following a variety of technical snafus with sign-ups over the last few years. Parents looking to enroll their kids in the program, which provides low-cost before and after school care for students, will now be able to submit applications from April 1-May 15 each year. If schools have enough room, anyone who applied before the May 15 deadline will earn a spot in the daycare service. At schools that receive more applications than they have “Extended Day” slots available, however, applicants will be entered into a “random, double blind lottery” to sort out who earns a spot in the program. That represents a distinct change from the school system’s old process, which opened up registration on an online portal at a set time (often late at night), and only accepted applicants on a first-come, first-served basis. That prompted parents to race to register all at once, resulting in a series of system crashes the last few years. 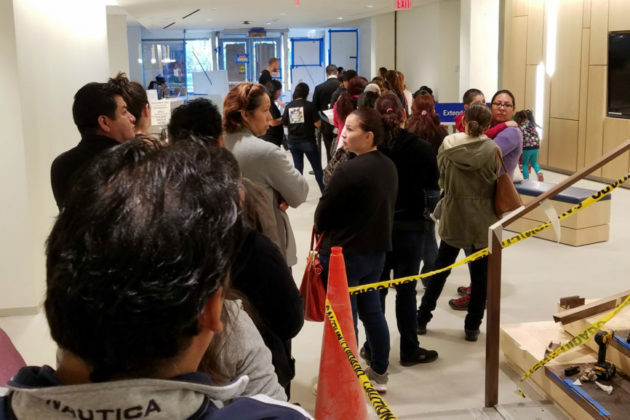 Just last year, frustrated parents raced to the school system’s offices in an attempt to register in person, as the technical glitches persisted. School officials wrote that the program saw a substantial increase in enrollment over the last decade — growing from “about 2,600 to over 4,300” students — which they believe contributed to some of the school system’s technical glitches. Officials stressed that no decisions about “Extended Day” enrollment will be made until after May 15 under this new system, and any child who misses out on a spot in a lottery process will be placed on a waitlist. 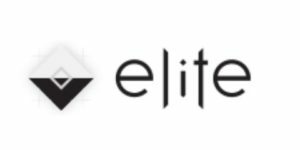 The school system noted that nine elementary schools (Abingdon, Arlington Science Focus, Ashlawn, Claremont, Glebe, Henry, Key, McKinley and Tuckahoe) have reached capacity for the program in the past, making them likely spots for lotteries. School officials also urge any parents applying for an option school to wait until those results are released on May 1 before applying for “Extended Day” inclusion. “If you are going to run a true lottery process, as they seem intent on doing, they need to conclude it much earlier than May 15, so families have an opportunity to make other arrangements if they don’t get lucky,” the parent wrote in an email, declining to give their name. The school system’s “Extended Day” webpage says that APS plans to post additional information on the new registration process on Monday (March 4). Arlington officials could soon advance zoning changes designed to make it easier for more childcare providers to open up shop in the county, as part of a lengthy push to increase access to daycare options for local parents. County leaders have batted around a variety of potential changes for months now, but they finally seem ready to pass a suite of zoning tweaks impacting both large childcare centers and smaller “family daycare” homes. The proposals will go before the Planning Commission’s Zoning Committee for the first time tonight (Wednesday), and could make their way to the County Board sometime later this spring. The Board previously approved a “Childcare Action Plan” last summer laying out some potential changes, including a new subsidy to help families afford daycare services. But it has long planned these additional zoning changes to encourage more childcare providers to move to Arlington, initially hoping to vote on them before the end of 2018 and address what officials see as the exorbitant cost of childcare in the county. The parking changes may well prove to be the most impactful alterations that the county is considering, as many childcare providers say Arlington’s current standards make it a bit difficult for them to open new locations along the county’s Metro corridors. Currently, the county requires that large childcare centers offer one parking space for each employee. But staff subsequently discovered that many childcare employees aren’t driving to work — a December study by the county found that roughly 40 percent of parking spaces for childcare centers currently go unused, and a survey of local employees found that 36 percent commuted by using public transit, biking, carpooling or walking. Accordingly, county staff are proposing requiring one parking space for every eight children attending a center, which should cut back on the number of parking spaces each one needs. The average daycare center in the county currently requires about 40 spaces using the employee-based ratio; the new proposal would cut that number back to about 25 spaces per location. That would put Arlington more on par with parking requirements in Fairfax and Prince William counties, where daycares generally have 32 spaces and 24 spaces, respectively. Staff are also suggesting that the Board allow additional parking reductions for centers hoping to locate near Metro and bus stations, letting companies apply for less parking as part of the process of earning a use permit from the county. For comparison, Alexandria lets childcare centers have as few as three spaces if they have access to transit options, while D.C. only requires five spaces for all centers. The transit advocates over at Greater Greater Washington are especially enthusiastic about that section of the plan. The group’s development director, Pentagon City resident Jane Fiegen Green, praised the county for examining parking requirements in a recent blog post, and urged readers of the site to back changes to such “outdated” standards. While the parking changes would largely impact centers educating dozens of children, many of the other proposed changes are aimed at loosening standards for smaller family daycare homes. By bumping up the maximum number of children allowed in each facility to 12, the county would come into alignment with the standard outlined in state law. Arlington and Alexandria are currently the only localities in the D.C. area with a cap of nine children, staff wrote in a report for the zoning committee. 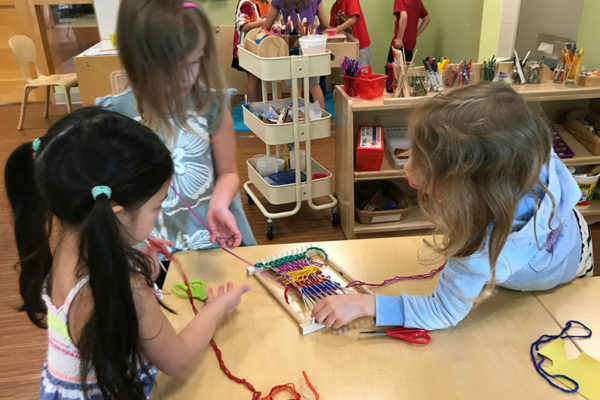 “Expanding the maximum number of children will increase Arlington’s potential child care supply, align with the maximum set by the state, provide potential additional revenue for providers and additional child care jobs in homes that are able to increase their capacity, increase opportunities for children to play together and help address the county’s lengthy child care wait lists,” staff wrote. The recommendations also call for easing permitting requirements on small providers, as many are “intimidated” by the complex process of earning the county’s permission to set up childcare facilities. Staff found that centers with nine children or fewer regularly operate “without significant disruption to their surrounding neighborhoods,” so it would make sense to allow them to open up “by right” without extensive permits. So long as the zoning committee signs off on these zoning alterations, the County Board could order public hearings on the matter at its Feb. 23 meeting. The Planning Commission could then take them up on March 4, setting up a final Board vote on March 19. 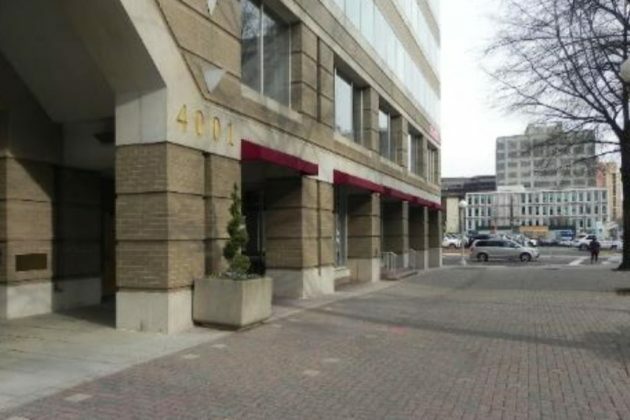 Arlington officials have given the green light for a new childcare center to set up shop in Ballston, in a debate that forced the County Board to weigh its years-long effort to expand access to childcare in the county against the vocal opposition of neighbors to the project. 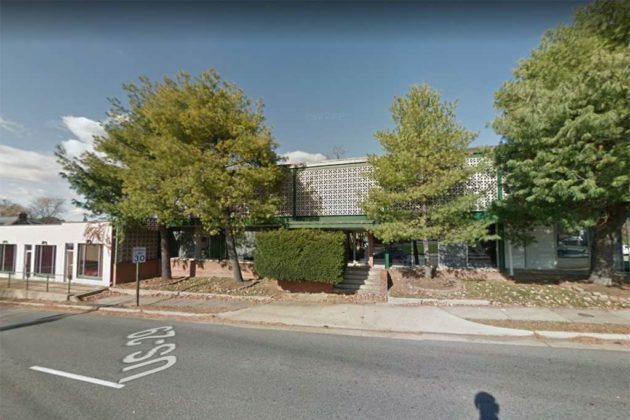 The Board voted unanimously last night (Tuesday) to award the Bright Horizons Children’s Center with the permits it needs to open a new location on the first and second floors of a building at 4001 Fairfax Drive. The new center will have room for about 145 kids in all, and include a 4,700-square-foot playground in the small courtyard between the building and an adjacent set of condos at 1001 N. Randolph Street. The playground, in particular, worried neighbors. 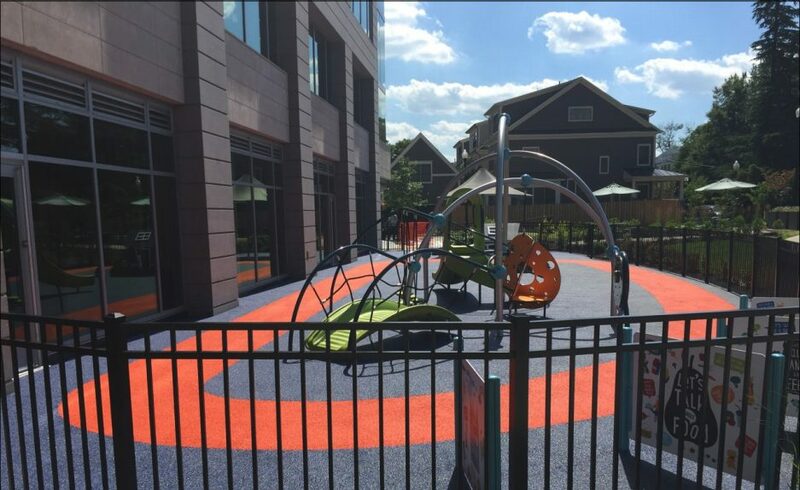 Matt Nyce, a board member at the nearby EastView Condos, told ARLnow via email that the location was a “totally inappropriate” place for a playground, given its proximity to two exhaust fans and how close it would be located to homes on the first floors of the two buildings. But Board members were convinced that some of those concerns were a bit overblown — as Erik Gutshall put it, the Board judged the childcare center unlikely to be “an overwhelming detriment” to quality of life in the area, or to property values. Officials would acknowledge that the playground would be a bit of a tight fit in the courtyard, and that it would occupy some of Ballston’s very limited open space. But, as the Board weighs a comprehensive overhaul of its zoning regulations governing childcare centers, members also said that they were willing to allow designs that may not be absolutely perfect if it means expanding options for Arlington parents. The Board did not make the decision lightly, however. 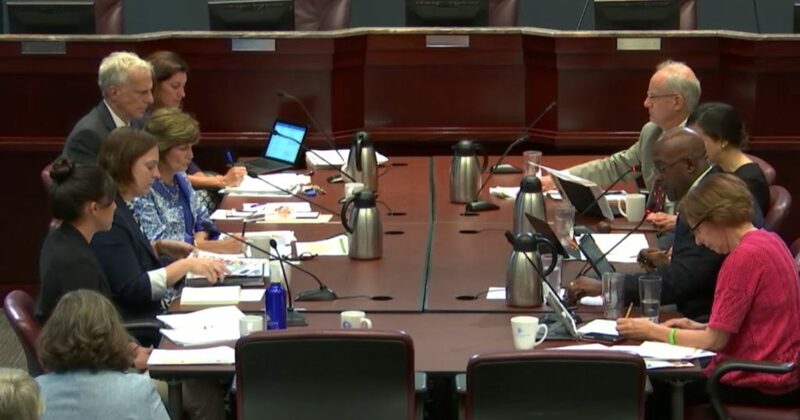 Board member Katie Cristol, a lead backer of the county’s childcare overhaul, said she even considered pushing for a deferral of any decision on the matter, particularly after the Ballston-Virginia Square Civic Association decided to oppose the project. Collier Cook, the group’s president, told the Board that he worried that dropping a playground on the site would rob the nearby residents of some crucial open space. And, as an EastView resident himself, Cook said he understood the concerns of his neighbors. One, Andres Delgado, told the Board that the prospect of additional noise was particularly concerning for people who live in the building and work from home. Similarly, he said neighbors are worried about smoke from the nearby parking garage impacting the kids’ health. But Zach Williams, an attorney representing Bright Horizons, said the company made every effort possible to address those playground concerns. The childcare center plans to pay for a timer to ensure the exhaust fans aren’t operating while children are outside, and Williams said they even agreed to shrink the playground by 200 square feet to give residents some more breathing room. Yet, with the county’s ordinances requiring that the center add 75-square-feet of playground space for each child outside at any given time, Williams said Bright Horizons can’t do much more to address those issues. “We don’t have a lot of flexibility, but we’ve tried to do as much as we can,” Williams said. Board members commended those efforts and made another point for neighbors worried about noise — considering the way the area is zoned, a new bar or nightclub could easily move into the space instead and set up outdoor seating, which could prompt even more substantial noise concerns than the childcare center. With this approval in hand, Williams said the center plans to open by January 2020. Bright Horizons is also on the cusp of opening another childcare center in Courthouse, which also faced its fair share of pushback from neighbors last year. 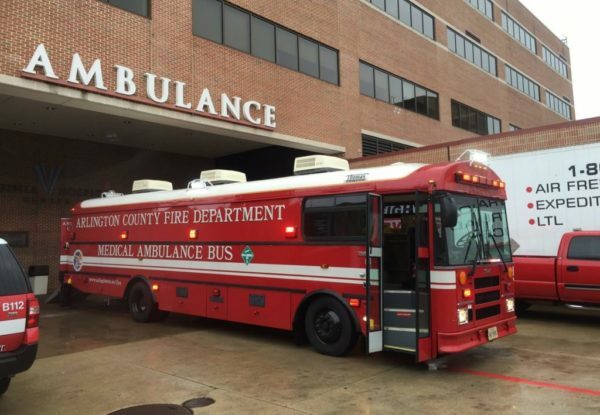 Students at a Clarendon area daycare center are spending part of their morning on the Arlington County Fire Department’s mass casualty ambulance bus. 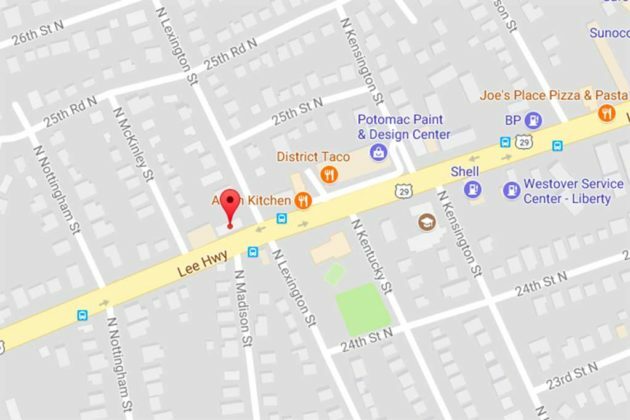 A fire department spokesman said the ambulance bus was dispatched to the 1200 block of N. Ivy Street, where firefighters are investigating a possible gas leak inside a building. The block is home to NOVA KinderCare, a daycare center. The spokesman said the bus was deployed to keep children warm as firefighters investigate the reported leak and await the arrival of Washington Gas. Update at 9:35 a.m. — The daycare building has been deemed safe to re-occupy, according to scanner traffic. 8:23am today units called to 1200 blk N Ivy St for smell of gas in Daycare. No medical issues reported. Kids were moved to nearby building while cause was investigated. Issue isolated to HVAC which was shut down. Building ventilated. Kids returned to building for parent pickup. A proposed childcare center on Lee Highway that has irked neighbors for months is now on track to open in the next few months. The County Board unanimously signed off on a permit Tuesday to let Little Ambassadors’ Academy move ahead with plans to open a third location at 5801 and 5901 Lee Highway. The childcare center is now on course to open by February or March of next year. 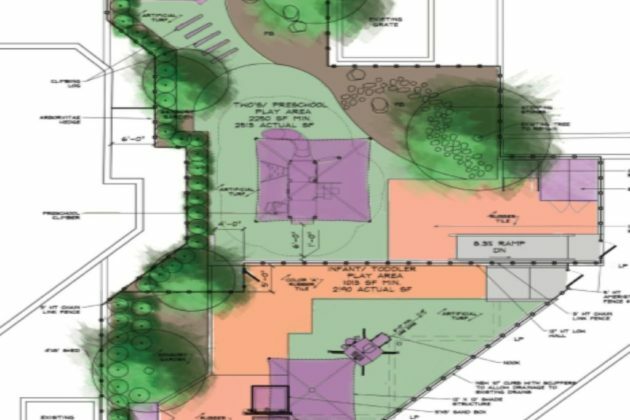 The daycare company has hoped for just over a year now to remodel two existing buildings on the property and create space for as many as 155 children, but people living nearby have repeatedly raised concerns about how the facility’s addition would impact traffic in the area. Two people living behind the site even filed a lawsuit to block the daycare center’s construction after the Board lent its initial approval last September, though a judge tossed out that case in January. The Leeway Overlee Civic Association has raised concerns about the project as well, urging the Board to restrict the number of children allowed at the facility in a bid to ease traffic in the area. All the while, Little Ambassadors has worked to open up the new center — but the process has dragged on so long that the permit the Board issued last year came up for review, even though the daycare has yet open. Nevertheless, neighborhood concerns linger. Adam Watson, a staffer in the county’s planning division, said he’s heard from a variety of people in the area concerned that the daycare will snarl an already-busy section of Lee Highway. The original District Taco location sits just down the block, and a new 711 is on the way nearby at 5747 Lee Highway as well. But Joanne Gabor, who works with county’s Department of Environmental Services, assured the Board that staff believe Little Amabassdors’ strategy for managing traffic in the area “is a good plan and it’s workable.” And without any real-world examples of the childcare facility’s impact on the local traffic, the Board wasn’t inclined to change its original decision. Board member Libby Garvey added that Little Ambassadors’ track record at its other Lee Highway locations, at 5232 Lee Highway and 3565 Lee Highway, also gives the Board confidence. 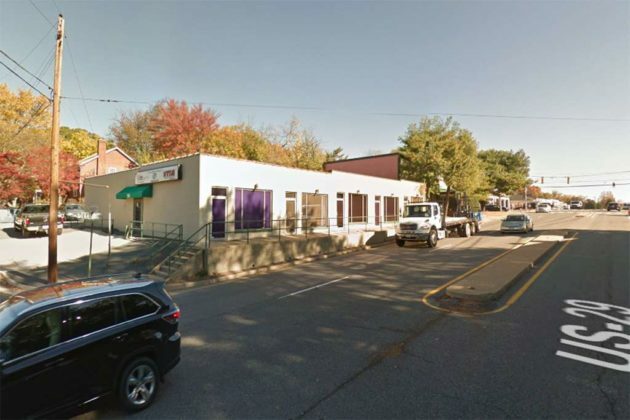 The Board will review the daycare center’s use permit once more in September 2019, when it will have a chance to assess any potential traffic impact. Arlington is looking for a bit more feedback on the county’s plans to expand access to childcare, releasing a new community survey on the topic. That document calls for the implementation of several new initiatives, like a subsidy program to defray childcare costs for families who don’t qualify for state assistance and the streamlining of the county’s online resources for parents. 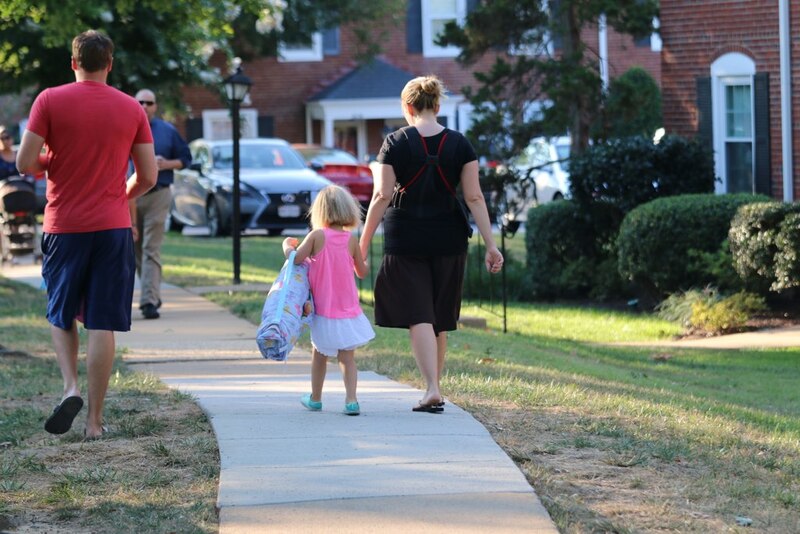 But the Board is also weighing some zoning and code changes to make it easier for daycare facilities to operate in Arlington, and pledged to collect more community feedback ahead of proposing those policy tweaks later this fall. The survey asks respondents how they currently meet their childcare needs — via a public or private childcare program, a babysitter or a family day home childcare provider — and in what zip code of the county they live, work and patronize childcare facilities. Respondents are also asked to select their preference for where they’d like to see daycare facilities located. 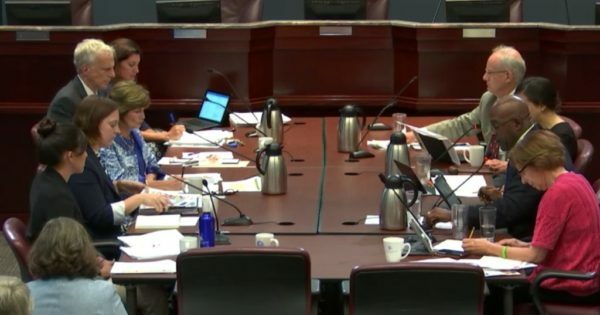 That’s a key point the Board has debated in the past, as it found that many county workers rely on childcare services in neighboring localities like Falls Church or Fairfax County. 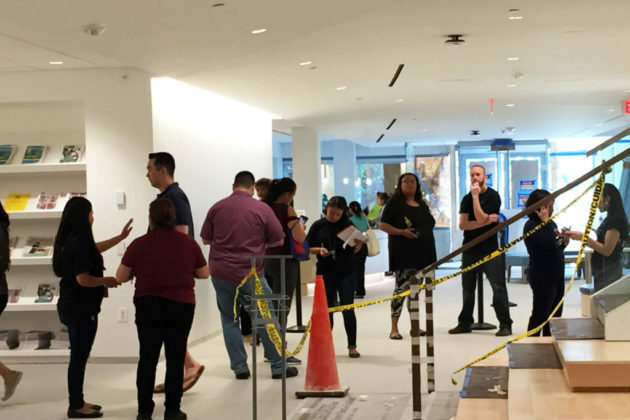 Members have often sought more clarity on whether that’s because services in Arlington are inaccessible or because people who work in Arlington often live outside of the county and are looking for closer options. The survey also includes questions on what barriers to accessing childcare parents encounter around the county. Available responses include factors like transportation, cost, a lack of care when it’s most needed (before 7 a.m. or after 6 p.m.) and potential language barriers. The Board is aiming to pass more childcare changes by December. Arlington officials are moving closer to setting up a new financial assistance program to help families afford childcare, with overhauls to zoning and parking requirements for daycare facilities possible before the year is out. The County Board signed off yesterday (Tuesday) on a final version of a “Childcare Action Plan” it’s been eyeing since late last year, setting the stage for leaders to address the affordability and availability of childcare in Arlington following years of debate. In the near term, the county will work with local businesses and nonprofits to set up a program to defray childcare costs for families who don’t qualify for state subsidies, similar to existing efforts in Alexandria and D.C. Staff also plan to study the county’s childcare needs and shortcomings in more detail, building on work they’ve done over the last year or so, and make the county’s online resources for childcare providers a bit more streamlined. By December, the Board plans to rewrite some of its zoning ordinances to make it a bit easier for daycare centers to open and operate in the county, with the goal of bringing costs for parents down in the process. That same month, the Board will propose changes to the county’s childcare codes, with a vote on the edits soon afterward. Leaders haven’t quite finalized what all of those changes will look like, with community engagement and public hearings to discuss the specifics set for the coming months, but they’re broadly aiming to give parents more affordable options for daycare around Arlington. “We’ve come a far way, but we’ve got a long way to go,” said Board member Libby Garvey. Board Vice Chair Christian Dorsey pointed out that Arlington parents foot the highest average annual bill for childcare for an infant and a 4-year-old out of any locality in the region. The county’s average cost of $42,705 per year, compared to $40,521 in D.C. and $37,787 in Alexandria per staff’s findings, left Dorsey “gobsmacked” and eager to see what the Board could do to bring that figure down. One contributing factor could be the county’s parking requirements for daycare facilities. 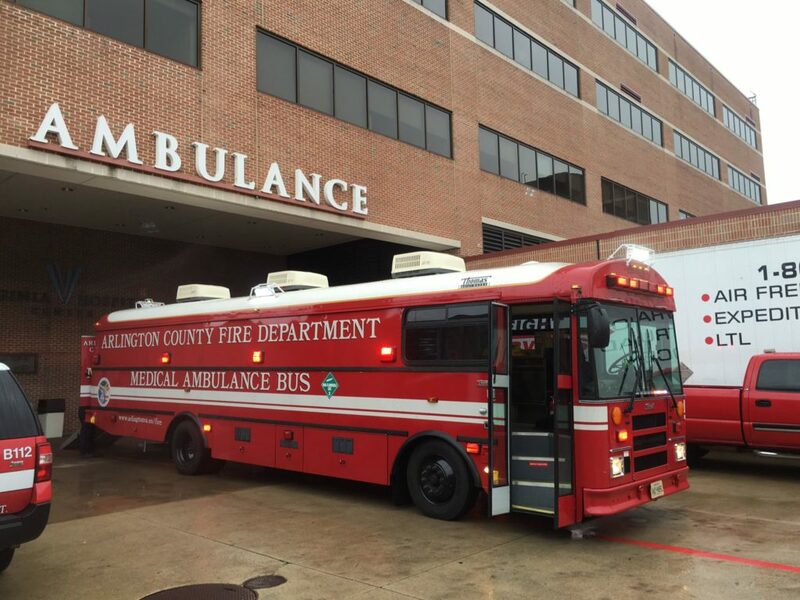 Deborah Warren, the deputy director of the county’s Department of Human Services, noted that Arlington currently requires providers to have one parking space for each employee, in addition to space for pickups and drop offs. The Board could tweak that requirement to make it easier for more facilities to open in the county’s densest neighborhoods, or even let smaller, family daycare providers avoid the lengthy process of applying for a special use permit before opening their doors. “If it takes less time, there’s less of a process to go through, hopefully we can increase the number that’s out there,” said Kimberly Vacca, an associate planner with the Department of Community Planning, Housing and Development. With roughly 13,435 children under the age of 5 in the county and 6,894 spaces in licensed daycares, as of 2015, county leaders recognize they have an urgent need to somehow attract more providers to the area. Dorsey urged the Board not to lose sight of the county’s focus on using its regulations to enforce high standards at all of its daycare facilities, yet the entire Board expressed a desire to see some of those requirements somehow loosened by the time this process wraps up. “To the extent that the pendulum swings between affordability and quality, the pendulum might’ve swung a bit too far away from affordability here,” said Board Chair Katie Cristol.